Can you tell I haven’t cleaned up my Studio from yesterdays card making? This sketch on SCS is quite simple today – quick and easy! Gotta love those sketches! I'll be using this sketch again, because I have so many images that can fit as the focal image, and tons of DSP to use up. 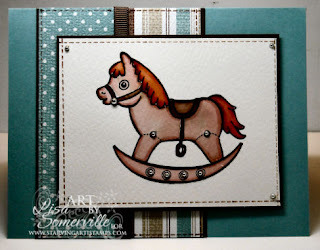 I stamped and colored the Rocking Horse the same as in yesterday's post, using the Marker Watercoloring Technique. Popped on some silver gems, and added some stitching using the Drywall Stitching Technique. Sure beats piercing all those wholes then added my Faux Stitching! I'm still working my way around Windows Vista and see they have a program for writing to your blog - Windows Live Writer. I poked around to see what it was all about - but didn't get that far - as I'm quite comfortable posting here through blogger. I'll have to take some time to see what it's all about - because it surely looks like an easy way to update my blog. Stamps - Starving Artistamps - DoodleFactory Oh Baby! Another cute card Lisa..I love Writer...it makes posting so easy, not that I know what the other programs are like as it is the oly one I have ever used. Claudia recommended it to me and said it was easy and stuff didn't get funky..so try it out! Another adorable card, Lisa! Fantastic coloring! !